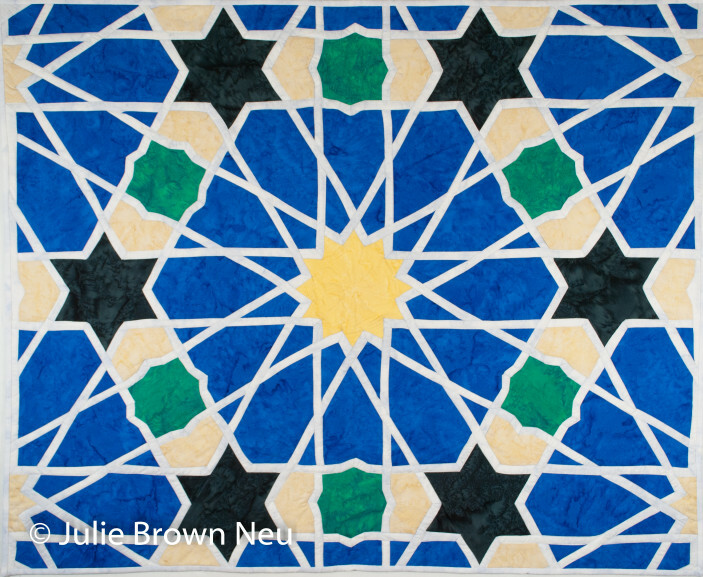 As I quilted Arabesque #3, I found myself thinking that I should call it “Divine Intervention” instead. The piecing certainly required a few prayers, but I have to admit that I had no faith at all when it came time to quilt. This one hung on my design wall for months because I couldn’t bring myself to quilt it. “It’s never going to work!” I thought. Well, I was wrong and I can only credit something greater than myself for the outcome. I had a few false starts quilting the center star. I finally took the recommendation of a friend and hand quilted it and that worked perfectly. Once that problem was solved, the remaining quilting only required a few hours. Really. And, I like the final product far more than I did when it was just pieced. I never believed that “quilting it out” was actually possible until now. It’s a miracle! Here’s the final product. I’ll be starting to plan Arabesque #4 on Monday.